Of the 800 or so individual mountain gorillas left in the world, half of these endangered species are found in Uganda. You can meet these wonderful animals on Gorilla Safaris in Bwindi Impenetrable Forest and Mgahinga National Parks in Uganda. The majority of the other half of the world’s mountain gorilla population are found in the Virunga complex (Volcanoes National Park in Rwanda and the Virunga National Park in Democratic Republic of Congo respectively). For more information about gorilla trekking in Uganda or Rwanda, including what to expect on a gorilla trekking experience, please visit Around Africa Safari’s FAQs page. No other area in Africa can match the amazing diversity of habitats in Uganda and Rwanda. This richness is reflected in the region’s bird list of over 1000 species. Ten of the most sought-after species for birders are: Shoebill, African Green Broadbill, Green-breasted Pitta, Nahan’s Francolin, Brown-chested Plover, Karamoja Apalis, Black Bee-eater, Rwenzori Turaco, Red-fronted Antpecker, Purvell’s Illadopsis. Together, Uganda and Rwanda’s birds constitute 67% of Africa’s and 11.1% of the world’s total bird population, which makes the two countries a must-visit for bird lovers. Feel free to drop us an email if you’re interested in finding out more about our East African bird watching safaris. Uganda alone boasts over 330 mammal species, conserved and protected by the Uganda Wildlife Authority. 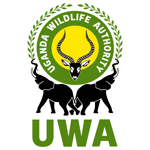 UWA is the legal body responsible for wildlife management and conservation of nature that regulates tourist visits to Uganda’s National Parks. Park activities include: big game viewing, boat ride safaris, bird watching, guided walking safaris (in certain parks only), nocturnal game drives and wildlife encounters. Iconic animals in Uganda and Rwanda include: Mountain Gorillas, Chimpanzees, Elephant, Hippo, Cape Buffalo, Lion, Leopard, Eland, Uganda Kob, Waterbuck, Rothschild’s Giraffe, Sitatunga and Burchell’s Zebra. Uganda offers some of the best grade 5 white water rafting activity in the world. The rafting trip starts in Jinja, Uganda’s adventure capital, where you will find East Africa’s only bungee jumping platform – with the drop touching the River Nile itself. Around Africa Safaris can arrange day, overnight or multiday excursions to Jinja, a two hour drive east from Kampala. As the White Nile flows north across Uganda, you can view the magnificent falls of Karuma on the eastern border of Murchison Falls National Park. Arguably the country’s most talked about natural feature are Murchison Falls themselves. Here the waters of the Nile are forced through a seven meter gap, dropping a spectacular 43 meters. You can’t come to Uganda without experiencing Murchison Falls! For more information about white water rafting and adventure activities in Jinja, and safaris to Murchison Falls National Park, visit Around Africa Safaris Uganda page.